The 3rd Annual Statewide Festival in 1948 was without any question, the best organized to date. The program itself consisted of six pages. New leaders were emerging. Walter Grothe was serving second term as president of the North and Virginia Anderson was president of the South. The ladies were much in evidence such as Carolyn Mitchell from the South who also calls a mean square and the same for Mildred Buhler of the North, also an excellent caller. While Walter Grothe was still president of the North, I would follow him in office as of June 1st. Virginia Anderson would serve as Southern president a second term during 1948-1949. 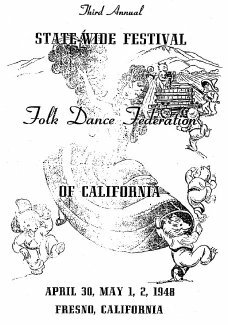 During the 1948 three-day Festival I sat in on a special meeting with Walter Grothe and Lawton Harris to discuss the upcoming folk Dance Camp at Stockton College of the Pacific. By the time Camp opened I would be in office and Lawton hoped I could attend at least part of the time. I assured him I could and would. The Festival opened with a Friday night party at the Auditorium, followed by a Teacher's Institute Saturday afternoon. Some of the featured Instute dances were "The Mexican Mixer," "Bruder Lustig," and the "Philippine Mazurka." The main festival was held Saturday night at Radclift Stadium where we danced on the grass. 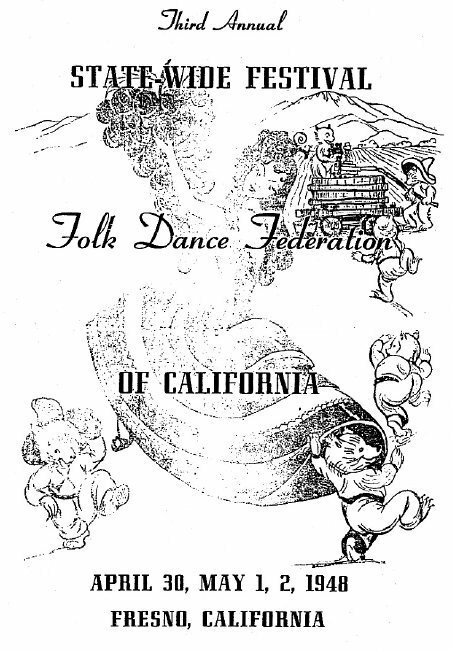 The Berkeley Folk Dancers were scheduled to do "Der Volgaster" as an exhibition. Our costume called for boots and I had a new pair just made for me by a famous San Francisco boot maker. He made them a little too tight and I could barely get them on. To complicate matters, I had broken my ankle the previous February. There was still a little swelling from time to time. The night of the festival as we were preparing to leave, I couldn't get that boot on. Time was getting short and we were scheduled to exhibit first. After much tugging by me and my friends, I finally made it and we rushed to the stadium. As we entered, I heard myself being paged, as our group, minus me, were all lined up and ready to go. I made it, but just.